Bespoke quality hats and fascinators made to your request from Nicola’s Bristol based studio. 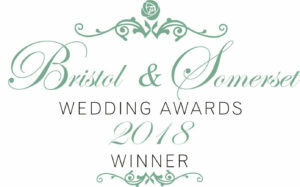 Nicola Jayne Didcott Millinery is incredibly proud and grateful to have won the Accessories category at the Bristol & Somerset Wedding Awards 2018. A huge thank you goes out to the clients that nominated Nicola and spent time giving their feedback. You can read more about Nicola’s award and the feedback received here on her blog. Nicola is nothing short of amazing! I wore my Mothers 1956 dress to get married in, and Nicola created the perfect hat, using fabric from the Jacket that originally accompanied the dress. She was thoughtful, creative and full of vision, and so sensitive when it came to chopping up the jacket. I absolutely loved the final result and wore it with pride on my wedding day. Absolutely everyone commented on it throughout the day. Nicola is great fun to work with, she listens, has a think and then delivers the exact perfect solution! I can’t wait to be invited to another function so that I can get another hat made. Thank you so much Nicola.